a very helpful, easy to read book. " Welcome to the real world of permanent cosmetics. Permanent Make up Guide illustrates the outstanding results that can be achieved with permanent cosmetics through a full-colour gallery of real before and after images of procedures. Designed to help people find the best artist and procedure to fulfil their requirements, this book will help readers through the process, in order to get the best results from their enhancement. The guide also answers the top 25 questions asked about all cosmetic tattooing procedures. The book is written by renowned artist Hina Solanki, the founder of Sol Cosmedics, an internationally regarded provider of permanent and semi-permanent cosmetics. Their specialist services include permanent make-up and medical scar camouflage, which has the ability to transform the lives of patients. As illustrated in the book, carefully implanted pigments allow colours to create illusions and may even be able to delay cosmetic surgery. 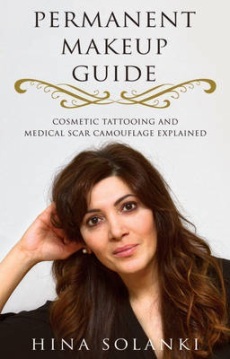 Following a health scare of her own, Hina Solanki developed expertise in medical scar camouflage using permanent and semi-permanent cosmetics. The inspiration behind her book lies in her desire to help others rediscover their self-confidence after illness or injury. Permanent Make up Guide is a must-have book for anyone considering the use of permanent make up or medical tattooing. The results can be life-changing for some.